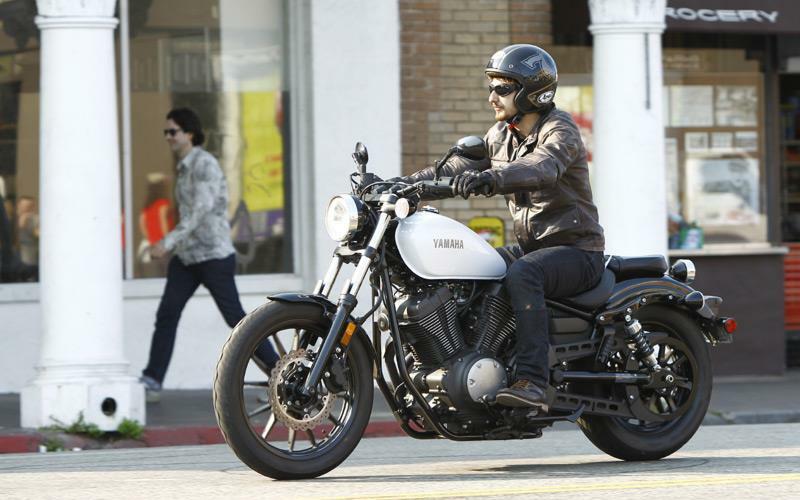 Like any proper bobber, Yamaha’s XV isn’t for the long, open road but is more suited to the urban dude. Yamaha has kept it relatively light, at 247kg, and a super-low seat height of 690mm makes it easy to control for virtually everyone. An abundance of torque delivers a fun, responsive ride and having suspension and brakes that work goes a long way to increasing confidence. The belt-drive motor is lovely to use and the XV is a good looking piece of machinery. 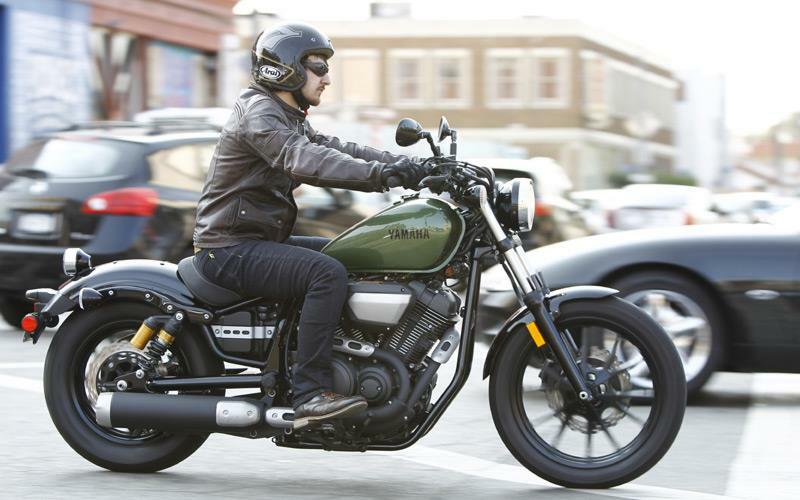 Watch out Harley Sportster, you might have a serious Japanese rival for the first time. 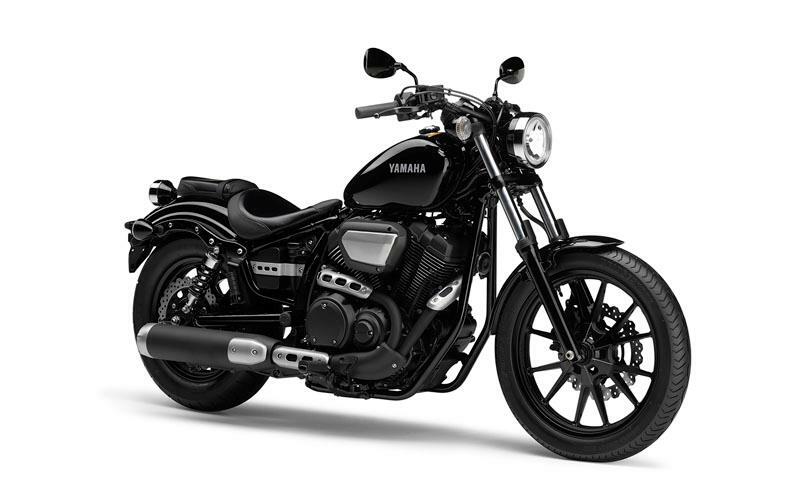 The XV950’s chassis is all-new and has been designed to be sportier than previous XV models as well as looking the part. Although it is a relatively small bike, the XV still feels fat and comfortable with a nice reach to the bars from the seat, however it is when the road develops a few corners that the Yamaha really impresses. Ok, the ground clearance is fairly limited, but the XV corners far better than most cruisers and can be ridden spiritedly thanks to a good chassis and excellent (although budget) suspension. The brakes also perform well and the ABS is effective in its operation. The level of detail and finish is very high on the XV950 and the air-cooled V-twin engine is a tried and tested lump. You get a good looking bike and that’s about it. Yamaha have used a lot of brushed aluminium, which is nice, but only the R version gets ABS. The XV950R costs £7,799 and comes with a different seat, ABS and piggyback shocks. 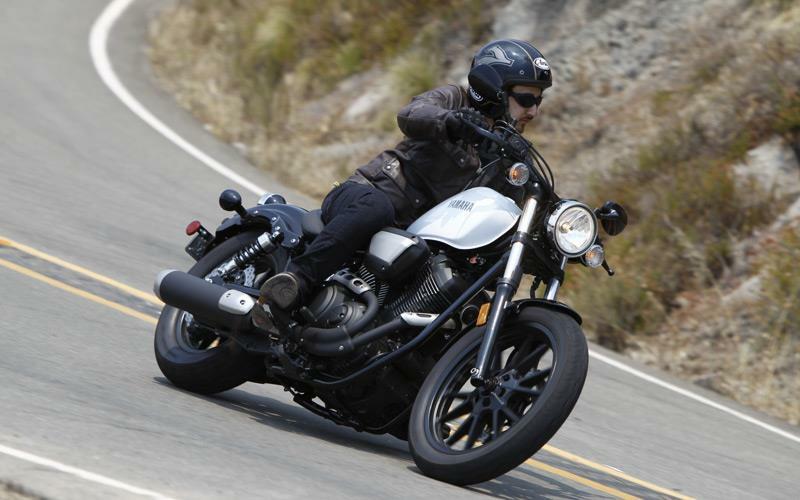 4 owners have reviewed their YAMAHA XV950 (2013-on) and rated it in a number of areas. Read what they have to say and what they like and dislike about the bike below. I love the noise, power and how easy it is to ride the bike. Also how comfy it is for someone who is my size (6ft 2). Its brilliant for the lanes and around town. Dislike the indicator controls and how the lights are all bulb less the rear light which is LED (why not all LED). Unless you have a screen or ride at 60mph then motorway riding would become tiring as the wind hitting you in the chest is hard work above 60. I do NOT regret buying it and smiled the whole time on taking it out for the first time. The noise from the Akrapovic exhaust is beautiful and turns heads. Once I found the riding position (as daft as that sounds) the bike is very comfy and got zero bum numbness! I went for the racer as its seat height is higher (I'm 6ft2) which hopefully gives me that little more room. Also I have no problems with my knee rubbing on the air filter I have read about in other reviews. Its a little hard on the shoulders/arms as the tank isn't wide enough to grip with your knees as you would on a sports bike but again once you find the position all was good. Its corners extremely well but with new tyres and damp roads I wasn't scraping the pegs....yet....just feels like you have loads of control and feedback from the steering. I have to say I was extremely impressed with how it handled. Front brakes feel a little weak when slowing from speed.....but it is brand new so maybe just need bedding in however used with engine braking there is more than enough stopping power. For me the levers seem a little to far away from the bars (And I have big hands) so it might be worth investing in the optional billeted levers which are adjustable. to early to say yet but its using a long used reliable engine so can't see any future problems. and its looks well put together and I haven't read any reviews yet of the earlier XV950's having any trouble with corrosion etc so can't see that being a problem for the newer racer. apart from the initial servicing required at 600 miles ( or 6 weeks) its a standard 6500 miles between them. Once out of warranty will do my own. Its has NOTHING on it other than ABS... But remember this bike was made so you can customise it YOUR way so I can understand to some degree why Yamaha did this....Would have liked a rev counter though. the indicator controls just feel like they are going to break off everytime I use them (can't feel if I've turn then on or off through gloves) however all others seem fine and in perfect positions for your thumbs etc. The display is basic and very clear and easily seen whilst paying attention to the road. I had the belly pan fitted and the Akrapovic exhaust (Yamaha accessories)......like music to your ears along with the V Twin.....will be removing baffle soon. ALso will add Yamaha LED indicators to the rear to go with the LED back light (why only the back light Yamaha??) I only gave it 3 stars due to the basic bike Equipment is, well.....nothing. However the whole point of this bike is to customise it your way. Bought from a dealer (Len Manchester) or delivered even though I live down south. Reason? because they were nearly 2 grand (yes 2K) cheaper than my local Yamaha dealer (who wouldn't budge on the 8K price tag and wouldn't give anything off the extras). Also they (especially Jamie) have been brilliant from start to finish and I have NO regrets buying from them and would do so again in a heartbeat. Pleasure to ride both on A and B roads; call me crazy to throw this type of bike onto B roads, but you can really have some fun as long as you don't expect sports bike behaviour. I've had my XV950R for a year now, ridden through winter on a daily basis commuting to work and the only thing I'd improve is the back end feel in the wet... but it might improve with a different tyre. If I am picky, the seat could improve its comfort but it's absolutely fine for the regular 130 miles between refueling, especially if you are not doing motorways. I do not carry pillions so can't comment on that but the seat (which I removed) was tiny, so I suspect comfort would be worse for a pillion. Brakes are fine with the front being surprisingly good for a single disc and the ABS on this R spec is not intrusive at all. The suspension is "softish" absorbing well the majority of our road bumps. Smooth power delivery for a v-twin - but I guess this one's been trialled and tested for years. Absolutely love the torque which is not only present at the low end, making overtaking easy without dropping a gear even at motorway speeds... you ask for it and it replies: "yes Sir, right away!" Solid built quality, nothing feels cheap, no corrosion anywhere even riding through winter. I do tend to wash her every month and apply adequate protection products. Great value; first service shy of £120, just serviced it at 4500 miles and it cost me £250 which for a years worth of riding i don't think is bad. I like it simple, so not a problem; it's a "modern bobber" as i've heard them call it, so it's blacked out and back to basics... but you know what? Basics are great! I will change the stock exhaust though... i would love it if they'd made it a bit gruntier; such a good looking bike, begs for a better and louder sound track. Bought from a local dealer; extremely professional and helpful as always, with no pressure at all. Fun to ride, great engine. Ideal for first time rider despite weight. Just wish that the front brake was a bit better. Back end is a bit harsh, perhaps the R spec is better. Surprisingly quick, good on the motorway with instant overtaking power, no need to drop down a gear. I find this cheap to run. The worst mpg so far is 60, best is 73. Insurance costs are very sensible. Basic but I'm not bothered.Yamaha accessories are unbelievably expensive- ebay is your friend.